The rentista income requirement has been raised by the Immigration Department from AR$ 8,000 pesos to AR$ 30,000 pesos in July 2016. This affects new applications but also renewals. Please have this in mind if you are preparing your paperwork for your residency renewal. 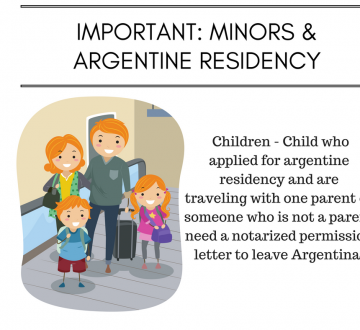 If only one parent plans to leave Argentina with children/child who applied for residency you will be asked to show a notarized permission letter, failure to provide this document will result in travelers being refused exit. Please contact us at zaira.vilches@celano.com.ar for more info!